We were involved in quite a few battles in the intervening years, particularly in UCATT fighting corruption [see that section], and in support of site and other workers in struggle. However since the Laings Lock Out the most significant industrial dispute we were involved in 'on site' was in the public sector. Southwark Council Direct Building Works Department to be precise. This took place in 1995-96 when a BWG supporter John Jones a brickie and UCATT shop steward - who had long been a thorn in the DLO Management's side and also very relevantly that of the UCATT Convenor Steward Tony O'Brien - was singled out and victimised by management and told he'd have to accept a transfer to a private building contractor named Botes or be sacked. To disguise the attack on this militant shops steward, as is often the case, they told another few DLO workers they'd also have to accept such transfers. Terry Mason a plumber in the EPIU/TGWU took a stand alongside John Jones against the transfers reminding Southwark Council they had a grievance out against the transfer to Botes with the Council. The Council then came up with one of the most idiotic pieces of management claptrap the BWG have ever heard and believe us we've heard some! They said Botes would deal with their grievances against being transferred to Botes! Incredible but true. All of this utterly contrary to nationally agreed union/management procedures for dealing with grievances. O'Brien, the Convenor Steward who is on the broad left and Hehir, a full-time UCATT regional official, both of whom are on the broad left in UCATT, and J Rouse, TGWU/EPIU official, then entered the fray and guess what? Promptly backed the management's sacking of John and Terry and agreeing their grievance procedures should be heard by Botes! Astonishing but true! There then followed this series of events that are worth repeating [with updates] in the same detail as in the first edition of this pamphlet in 1996 particularly as the main trade union 'villains of the piece' are still very active in UCATT and that obnoxious scab O'Brien is still masquerading as some sort of champion of worker's rights via the completely pseudo and toothless 'Construction Safety Campaign'. 13th November 1995. The council were given a week by the two workers they'd sacked to reinstate their grievance procedures in line with the rule book. When this eminently reasonable request was refused John and Terry decided to put a picket on the Frensham Street Building Works Depot, the largest. The BWG was asked to support the picket. We did so wholeheartedly and not one DLO building worker would cross the line of about twenty people. O'Brien then bullied and pressurised the DLO workers into crossing the picket line. He also told some of them they'd suffer the same fate as John and Terry if they didn't cross. The picket was lifted on the promise of a mass meeting but this was broken. 20th November 1995: After a week another picket was put on to try to force the council's hand. Again, not one worker would cross. Again, O'Brien bullied them over. Disgustingly, the SWP publicly backed the convenor's scabbing. So S stood for Scab Workers Party. 11th December 1995: Picketing was stepped up that day and a lobby put on the meeting of the London and South East Regional Council of UCATT. The lobby demanded a mass meeting and for the workers at this to have the right to vote for reinstatement of the grievance procedures. O'Brien, who was on the Regional Council, and Hehir were completely opposed to this. The lobbyists were told Southwark Council had given UCATT ten days to get the picket off or they would face a high court injunction, putting massive pressure on the Regional Council. We reminded the regional council, and Brumwell the General Secretary who was lurking about in the building, of the 'Laings lock Out'. To their tremendous credit the regional council went completely against O'Brien and Hehir by deciding a mass meeting should go ahead and to call on the Council to reinstate the grievance procedures. The power of the picket! Without the picket John and Terry would have been long gone! 20th December 1995: The mass meeting voted overwhelmingly for reinstatement of the grievance procedure and there was a definite feeling for industrial action to support this vote. Such was the feeling the TGWU/EPIU official J Rouse went straight to his office and penned a letter to Southwark Council requesting reinstatement of the grievance procedures. Some change of heart but welcome! Someone asked what sort of action would it take to move the council. A strike and picketing said the two workers and the BWG. 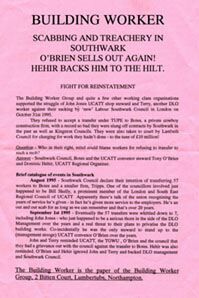 February 16th 1996: On this day a meeting of London and South East Regional Council of UCATT was told Hehir had taken legal advice and this was that the two workers would have to accept the transfer of their grievance to Botes - who would decide the outcome. Of course legal advice and action can and has been ignored but the Regional Council meeting felt it had no alternative but to go along with this advice. What legal advice? John and Terry won Industrial Tribunals! John and Terry had taken the precaution of applying for Industrial Tribunals, knowing they wouldn't be able to sustain the picketing in the face of the Convenor's scabbing and him and Hehir supporting the council in sacking and victimising the two workers. They won the subsequent Industrial Tribunals for unfair dismissal hands down. Obviously the Tribunals [industrial courts!] were not too impressed with the validity of Hehir's so called legal advice. Meanwhile back to O'Brien Not content with the most disgusting, unprincipled and unprecedented display of scabbing we've ever heard of or witnessed by a convenor steward, O'Brien with the assistance of the now thankfully defunct Workers Revolutionary Party [WRP] and one Dot [some say Dotty] Gibson smeared us quite heavily in the, now also thankfully defunct, 'Workers Press' newspapers of 2nd, 9th and 16th of December 1995 respectively. We and the two sacked workers are accused of.... mounting a "Fraudulent, sectarian 'picket line' " and of "this provocative action" and they ask, "are we an anti trade union group or what?". That's called smear by speculation! John Jones, talk about adding insult to injury] through the Southwark and Bermondsey UCATT Branch, effectively with picketing and called on the union to discipline us for it. This is particularly loathsome and it is unprecedented for any section, or person, in a union to effectively charge 'fellow' trade unionists with picketing. It clearly lined him up with the anti-union laws. In reply to these smears [of which there have been many down the years, particularly against me, and I expect a few more!] we in the Building Worker Group write A Picket is a Picket, is a Picket. A Convenor who forces workers across this against their wills is a Scab, is a Scab, is a Scab. Regional Council throw out O'Brien's charges. The London South East Regional Council meeting who heard the charges against John Jones, Kenny Irvine and I threw them out. To be honest they and we almost laughed them out 'of court'. O'Brien lied that I had threatened him with violence and the only witness he called [obviously none of the workers wanted anything to do with the charge] was a transport supervisor, a member of the management, who's first utterances were to launch a tirade against trade unionism in general which didn't exactly endear him or O'Brien to the Regional Council. We suppose management felt they owed him a favour as he'd supported them so staunchly and decisively in the sacking and victimisation of John and Terry. Enough said! Victories in Northampton On a brighter note victories in Northampton Direct Labour Organisation. Twice in recent years painters in UCATT employed by Northampton DLO Contract Services [i.e. Building Maintenance] came to the UCATT Branch, of which I'm secretary, for help and advice when told on the first occasion compulsory redundancies were pending and on the second notices were issued. At the meetings they attended 'en masse' with their shop steward, with the UCATT Convenor Steward there, they were advised the only way to save their jobs, if the council went ahead with the compulsory redundancies was by striking and putting a picket on Westbridge the massive DLO Building and Transport Maintenance Depot near the town centre. We asked them if they were prepared to do this, they said yes to a man. I then conveyed a message along these lines, and no doubt the word went out by 'word of mouth', to the Labour Council in letters to the leader of the council and left him and them in no doubt we'd back whatever action the painters decided was needed to save their jobs. In the first instance the pending notices were issued, in the second they were withdrawn. Since then some left voluntarily, as sometimes happens, but we did win the day against compulsory redundancies. Once more the power of, even threat of, the picket! Of course in Northampton we were never faced with a scab convenor who'd backed management in sacking these workers and ordering other workers across any picket lines we set up against the sackings if they'd taken place. It shows what can be achieved when workers and trade union unity, solidarity and principle are the order of the day!